Happy Labor Day! We hope you are enjoying the holiday. We are having a BBQ with family and friends today. We are going to have kabobs and lots of tasty sides. Everyone is chipping in, but I volunteered to make dessert and Tabbouleh Salad, one of my all time favorite salads. 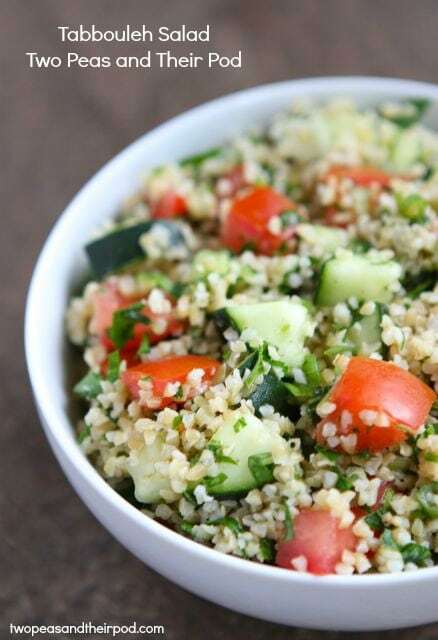 Tabbouleh Salad is a Middle Eastern Salad made with bulgur wheat (cracked wheat), tomatoes, cucumber, and fresh herbs. Our mint and parsley are growing like weeds right now, so we’ve been enjoying this salad on a weekly basis. It is so light and refreshing! Tabbouleh Salad is easy to make and full of flavor. All you have to do is soak the bulgur wheat in hot water and stir in the tomatoes, cucumbers, scallions, garlic, parsley, and mint. The salad gets dressed with fresh lemon juice and olive oil. Season with a little salt and pepper and you are good to go! 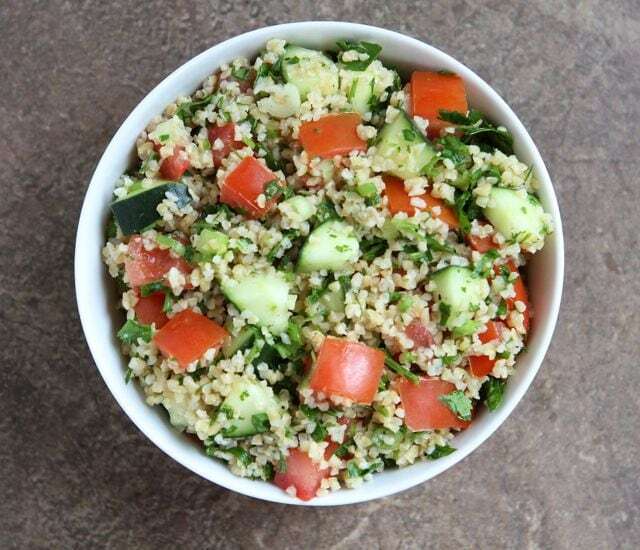 If you are looking for one more dish to add to your Labor Day menu, make this easy Tabbouleh Salad. Have a fun and safe holiday! And don’t forget to enter our Keurig Giveaway! Tomorrow is the last day to enter! A classic Middle Eastern Salad made with bulgur wheat, tomatoes, cucumbers, fresh herbs, and a light lemon-olive oil dressing. 1. Place the bulgur wheat in a large bowl. Bring the water to a boil and stir in the salt. Pour the water over the bulgur. Let it sit for 30 minutes, or until all of the water is absorbed. 2. While the bulgur is soaking, whisk together the lemon juice and olive oil in a small bowl. Add in the minced garlic and whisk again. Pour the dressing over the bulgur and stir. 3. Add in the scallions, tomatoes, cucumbers, parsley, and mint. Stir until combined. Season with salt and pepper, to taste. Note-this salad will keep in the refrigerator for several days. 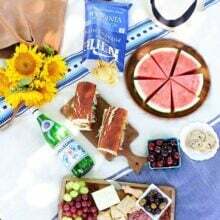 Another pefect labor day recipe! I love this kind of salad. I top it with extra tomatoes and call it dinner! 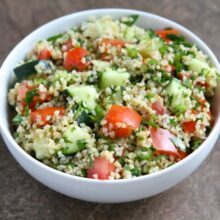 I’ve never made Tabbouleh salad, it looks amazing!!! Happy Labor Day! This is my favourite salad as well as my ultimate picnic food! I looooove tabbouleh!! And this salad looks fabulous! Yum! I love, love, love tabbouleh! Love! Thank you for the reminder!!! 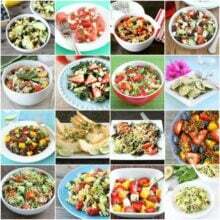 This salad looks really good and quick to throw together..happy Labor Day to you! I just made this for lunch using some leftover rice. It’s going to be yummy! My parsley and mint are also out of control, what a great way to use it up!! Happy holiday! I’ve never cooked with tabbouleh before, but this looks like a great recipe to try it out with! Thank you Maria! We buy tabbouleh at our grocery store (they make it fresh) but I’ve been wanting to make our own, having no idea how! Here’s my question: Where do you find bugler wheat? By that I mean, certain, specialty grocery stores? If its in a regular grocery store, where in the store? Thanks for your help! I buy it in the bulk bin section at Whole Foods, Smith’s, Sprouts, and Winnco. Most stores carry it. I hope you can find it. I love tabbouleh! I like to sub quinoa for the bulgur now and then. Great use for all the mint that’s going wild right now. Have a blast at your BBQ! I love end-of-summer barbecues; they’re the best. I’ve been wanting to make this for some time!! 🙂 Looks deelicious! Tabbouleh is so good and I’m jealous that you have mint and parsley growing like weeds! Tabbouleh is one of those dishes that don’t weigh you down but still has tons of flavor. All those tomatoes and cukes… looks delicious. I’m adding this to my next post for September’s seasonal recipes! Great post!! I used to work at a Mediterranean restaurant that had the most incredible Tabbouleh Salad – your version sounds equally as delicious. I hope you, Josh and Caleb had a great Labor Day. My kind of lunch salad right here! Hope you’re having a super fun labor day! Sounds fabulous. Looks very healthy and refreshing. 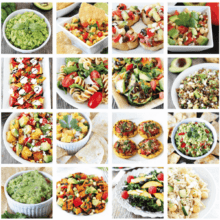 I have all these ingredients at home– can’t wait to make it! 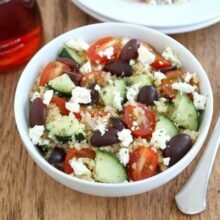 One of my favorite salads – i make it with Quinoa all the time! One of my favorite salads. So refreshing! I love tabbouleh. Such a refreshing dish! I use RED Mill bulgur wheat. It’s an excellent brand. My sons love this as a side dish for stuffed red peppers. My son took a picture of his dinner plate with this meal on it and put it on Facebook! Tabbouleh is one of those salads that I could happily eat day after day. I hope you had a wonderful Labor Day! I love tabbouleh. Such a fresh salad! Ahhhhh…I’m instantly transported to our visit to Egypt. Love tabbouleh!! Tabbouleh salad is my favorite! I was so happy to find some at a potluck this weekend. Yours looks absolutely fantastic, Maria! Tabbouleh is only my favorite Mediterranean food EVER!!! awesome recipe!! I adore a great tabbouleh salad. Thanks! It is still so hot here that this just sounds perfect to serve this week. 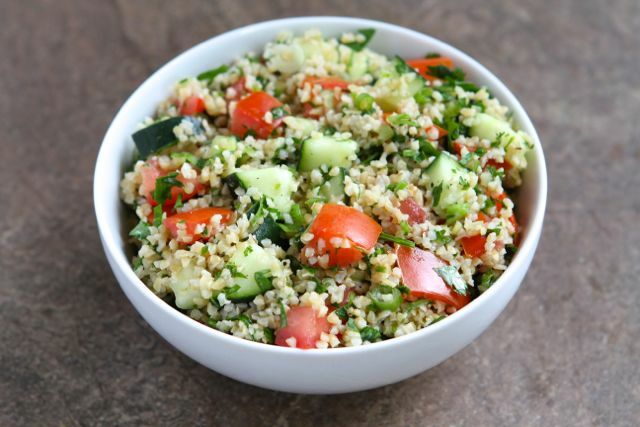 This is my favorite tabbouleh salad. I substitute freekeh sometimes for the bulgar. I need nutritional info, please. I am diabetic and need to know carbs and sugars in a recipe. Thanks. I clicked on it to bring it up and it disappeared…? Haven’t tried it yet, but years ago I happened across a Teabuleh Salad that I dearly loved so when I recently happened across a Teabuleh grain at my local Price Chopper, I bought it. The reipe on the box doesn’t call for cucumber and it’s been a long time ago but it seems there was cucumber in the salad I tasted and loved… so I started searching for one similar. I pan to try it soon.